CROSBY  Road construction was the topic for Pct. 2 Commissioner Jack Morman, and infrastructure director Jeremy Phillips at last weeks Chamber luncheon. FM 2100 is being finalized for construction from FM 1960 to South Diamondhead Blvd. into a four lane divided highway with scheduled contracts to begin in the Fall of 2018, according to the Texas Dept. of Transportation (TXDoT) website. The proposed widening of the existing two lanes undivided to four lanes divided by a raised median with five foot sidewalks on both sides and retention ponds met with nagative reaction from local residents. They said to not include the divided raised median section. TXDoT engineers however argued safety problems. Almost all of the public speaking at a May TxDOT hearing argued that not only would it be less safe but it would be detrimental to local businesses. Since that time inquiries discovered that the project is as yet unfunded. It is listed as a Tier 2 Project and seems to coincide with development of Highway 99, the Grand Parkway. The Grand Parkway is currently being planned although the website does not yet show an exact route for the roadway as it runs from its current construction through Montgomery County. The widening of FM 2100 from FM 1960 north through Huffman however is listed as under development but has not had a Public Hearing from local citizens. On Dec. 13 the first hearing is to be held at Hargrave High School from 5:30 to 7:30 p.m, see the ad. on page 6. 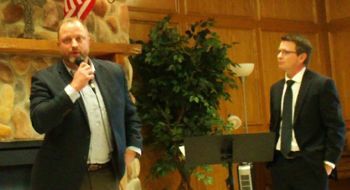 At the Crosby-Huffman Chamber of Commerce Luncheon last Thursday Precinct 2 Commissioner Jack Morman and Jeremy Phillips informed listeners that the project will begin the letting process in 2018. Phillips added that the countys efforts since that time have urged the state engineers to include as many turns in the raised median as possible to lessen the negative impact on local businesses within that area. Likewise the Precinct has asked if there is a way to reduce the amount of width of the project overall to reduce the impact on the residents on the east side of the roadway. According to Jeremy Phillips, the TXDoT plans to bid all of FM 2100 from South Diamondhead to FM 1960 in a single phase, but it will depend on the letting phase as to how negotiations go with local landowners. Scheduled for September 2018 the letting process could last into 2019 or even beyond. When the Grand Parkway moved back in planning, then widening FM 2100 moved back as well. answered Phillips on when the project lost time. TXDoT has already been in touch with landowners concerning some acquistions and moving fences in the Crosby sections.